Corona, CA- The Monster Energy AMA Supercross Series headed to Los Angeles' famed Dodger Stadium this past weekend. Race Tech supported riders filled the field once again, and Teddy Maier continued his outstanding performances on his privateer team HyperX bike tuned by Race Tech. Due to rain early Saturday morning, timed qualifying went from a normal 3 session format down to a single 15 minute session to qualify for the program. Bike setup was key, as the track was very hardpack on top, but had some extremely rough and soft areas between the jumps. With only one session to dial in the setup, the Race Tech technicians were busy ensuring all the riders were setup before their session began. Maier, Preston Mull, and Rockwell/FirePoliceMX.com rider Killy Rusk all easily transferred into the evening program in the Supercross Lites division. 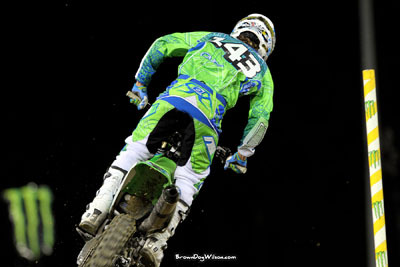 In the Supercross Class, Ben Lamay and Cody Gilmore advanced to the evening program. Race Tech's latest recruit, Michael Horban took advantage of all the mid-week testing with the Race Tech crew to also breeze into the evening program. During the night show, Teddy Maier would show once again he can run with the factory stars on his privateer bike by taking a 6th in his heat race, advancing straight to the Supercross Lites main event. By qualifying for the Lites Main, Maier became one of only 14 riders to qualify for all three main events thus far in the championship; quite an accomplishment for a true privateer. Maier would struggle a bit with breathing in the main event due to his asthma; however, he was able to log a solid 15th place finish. Maier will look to move himself inside the top 10 at Round 4 in Oakland this weekend. Maier currently sits 16th in the Supercross Lites West Points Standings as we reach the halfway point of the series next weekend. Upper: #143 Michael Horban debuted for the Race Tech Team at Dodger Stadium. 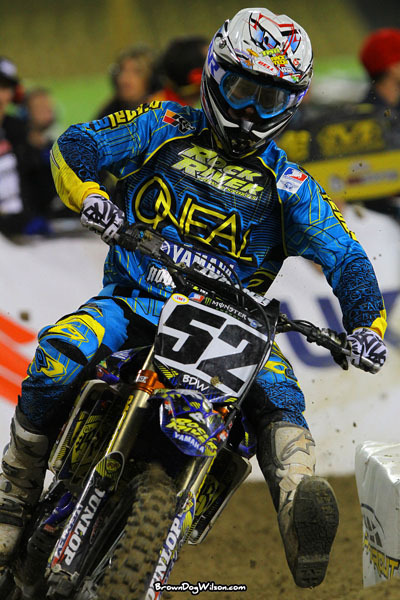 Lower: Ben Lamay (#52) continues to knock on the door of the highly competitive Supercross Class Main Event. Race Tech has a history of over 27 years producing the highest quality suspension components and tools; including Gold Valves, for most types of motorcycles and ATVs, to distribute worldwide.